Hours after a U.S. Air Force C-17 returned from North Korea with the first U.S. war remains to come back in years, Defense Secretary Jim Mattis said that relations between the two countries may be warming to the point that he could forsee U.S. forces returning there to find more. Mattis said recent overtures to North Korean leader Kim Jong Un, including President Donald Trump’s summit with Kim in Singapore last month, had dramatically changed a relationship that has been frozen for years. The return of the remains was seen as an important step in actions both sides have taken to reduce tension on the Korean peninsula. The U.S. has suspended its military exercises with South Korea as part of the U.S. terms of the agreement. “It was a coordination effort over the last month to determine where they would deliver the remains to, where our plane would fly in, where they would be taken to for the initial review," Mattis said. North Korean officials handed the remains over to U.S. military experts on the 65th anniversary of the Korean War armistice. Mattis said based on this round of interactions, it “is certainly under consideration” that U.S. military teams may return to North Korea to scout additional remains recovery sites. According to the Defense POW/MIA Accounting Agency, the last time U.S. teams were on the ground in North Korea was in 2005. Mattis would not get into the other aspects of the denuclearization talks between the U.S. and North Korea, nor would he provide any assessment on whether or not North Korea is dismantling its nuclear test sites. At a Senate hearing this week, Secretary of State Mike Pompeo testified that North Korea is still producing fissile material, on the other hand, satellite imagery released this week may show that the country is in the process of dismantling test facilities. 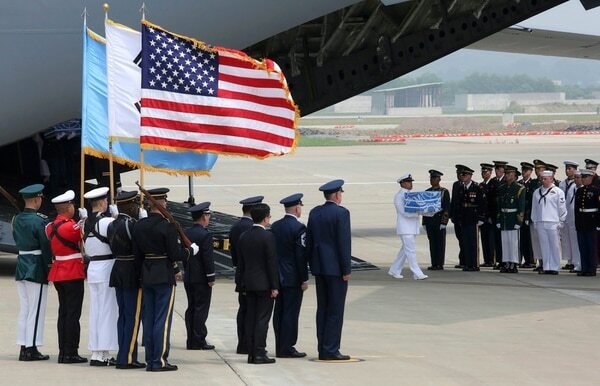 The remains were flown to Osan Air Base, where a formal repatriation ceremony will be held on August 1, United Nations Command said. “A formal repatriation ceremony will be held on Aug. 1, with plans to return the remains to Hawaii after that for further analysis,” the command said. Trump thanked Kim on Friday for “fulfilling a promise” to return the remains of missing U.S. soldiers from the Korean War, The Associated Press reported.